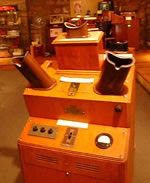 To check shoe sizes, we used old style wooden measuring sticks (which were even old in 1965) and we had ... believe it or not ... an xray machine in the back for difficult fits. I'm sure we were responsible for causing many future generations of sterility. Come to think of it ... as dumb as I was at that age ... I'm surprised I was still able to produce three kids myself. The older kids loved the measuring sticks. They were great weapons to fence with, hammer with and of course throw at the shoe salesmen with. Toward the end of my employment I was able to appreciate the same enjoyment the kids were having when I used these weapons on some of my customers, as well. But the most fun of all was fitting baby shoes. Back then, Stride Rite had baby shoes that weighed 10 pounds and ... on little feet ... looked like big white storm trooper boots. We know today that babies don't even wear shoes during the first months of walking so they can form their insteps and actually bend their little feet. I think parents bought our shoes to delay the process and take a few extra naps. 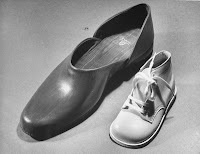 As tough as these were to walk with ... they were tougher to fit on baby feet. Babies struggled and cried while their feet were jammed into these boots. Worse was the fact that they had a natural tendency to ball up their toes so that it was next to impossible to get their foot to straighten up. Miss Nancy had a technique she showed us to release the tension in the toes. She told us to press under the baby's kneecap as the foot went into the shoe so the foot would relax ... Right! I tried it once and the baby got so upset that he projectile vomited all over me. I have just laughed-until-I-cried through all of your blogs. Great stories; great writing!